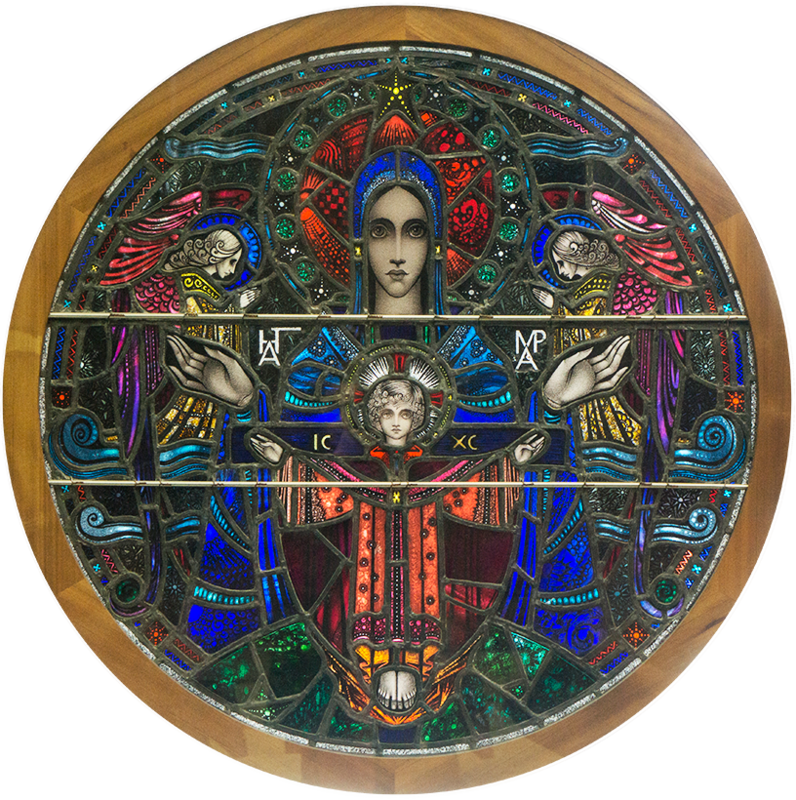 It has been a long-standing Catholic tradition to honour Mary during the month of May. In many Catholic churches and homes, a ‘May Altar’ is set up with a statue or picture of Mary, flowers, and candles as a reminder of Mary’s importance in the life of the Church and our own lives. This month WelCom features stories from some of the many Catholic women leaders of our dioceses. The Venerable Mother Catherine Elizabeth McAuley, the Irish nun, who in 1831 founded the Sisters of Mercy in Dublin, Ireland. 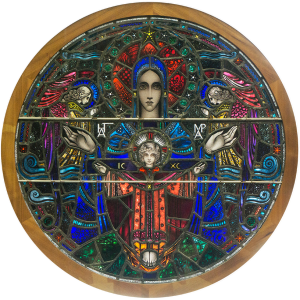 This month we honour Mary, Mother of God and Mother of the Church. Familiaris Consortio (The Role of the Christian Family in the Modern World) states that ‘parents must be acknowledged as the first and foremost educators of their children’ (#36). We look to Mary as the first educator of her son, Jesus. Prior to Vatican II the majority of women in education were religious sisters who taught in primary and secondary Catholic schools. Most secondary schools for girls were administered and staffed by women, which modelled for girls that women can be leaders in society and in the Church. The founders of many women’s religious orders would have concurred with the sentiments of Catherine McAuley, foundress of the Sisters of Mercy that ‘no work of charity can be more productive of good to society, or more conducive to the happiness of the poor, than the careful instruction of women, since whatever be the station they are destined to fill, their example and their advice will always possess influence…’. The education of women by women has indeed been ‘productive of good’, not only for the influence of women within their families, but also within the many public roles women now hold in society. With the renewal of the Church through Vatican II the importance of the role of the laity in the mission of the Church was emphasised. Many religious sisters undertook tertiary study in such areas as Scripture and Theology and used the fruits of their study in adult education to assist the laity to take their rightful place within the Church. Women, lay and religious are now engaged in theological and scriptural research. Their writings bring new insights to the richness of the Gospels and Scriptures, which resonate with women’s experience and help them deepen their commitment to Christ, the Church and Earth. Today the sphere of women in education is wide. Women are involved in education in schools, in The Catholic Institute, in universities, in spirituality centres, in Caritas to name but a few. Mary, Mother of God and Mother of the Church, pray for us. Sister of Mercy, Natalie Murphy rsm, has been a primary teacher in Catholic schools in Wellington and Blenheim, Religious Education Adviser to Catholic Schools in the Palmerston North Diocese, and assistant editor for the RE Programme for New Zealand Catholic primary schools. She is currently volunteering in classrooms at St Anne’s School in Newtown. Mercy sister, Sr Marcellin Wilson rsm, worked with Porirua’s teen parenting unit, He Huarahi Tamariki School – ‘a chance for children’ – from 1998 to 2008. In 2000 she was awarded the CNZM for services to community. She continues to advocate, make submissions to Parliament’s select committees and is a passionate founder and promoter of Wellington’s Homeless Women’s Trust. Anyone who has experienced working in Cannon’s Creek, Porirua, will be aware of the condition of the housing units there, which were once state-houses for the growing population of Pacific migrants. This was a background I was able to draw on after answering a request to assist with teaching at the first school for teenage parents established by Susan Baragwanath in the 1990s. Accordingly, when submissions were requested about the Residential Tenancies Bill earlier this year, I was more than willing to participate. I have always supported any call for a ‘warrant of fitness’ for residential housing, as my experience at Cannons Creek as a tutor gave me insights into conditions our students experienced as tenants. It became apparent to me that insulation of housing could not be taken for granted and that a landlord had no responsibility to provide such insulation. This matter was being addressed by Section 138B of the Residential Tenancies Bill, which looks at regulatory requirements for insulation be installed at premises; inspection, maintenance, or replacement of insulation; and quantities, locations, condition or technical specifications of insulation installed. One may wonder why this was not already a regulation after the comment by the Coroner in the case of the death of Emma-Lita Bourne in June, 2015. The Coroner’s report states the poor condition of the state-house in the South Auckland suburb of Otara was a contributing factor to the child’s death. Her mother reported to the Inquest there was mould on the walls and floor and a cold draught in her bedroom. Nearer to home, research in Porirua by Capital Coast District Health Board has shown damp, mouldy housing has a negative health impact and tenants of that area have high rates of acute admissions for bronchitis, asthma, pneumonia and skin infections. I find it difficult to understand a Wellington City Counsellor’s comment that giving ‘them’ insulation would only encourage ‘them’ to request double glazing! The cheek of them! If Mercy Doors can be opened on clean, warm, well-insulated homes I’m sure society would be blessed with a reduced impact on our hospitals as children might be able to thrive and grow strong and healthy in New Zealand homes. After all they are supposed to be blessed by living in a land that treasures their vulnerable children. 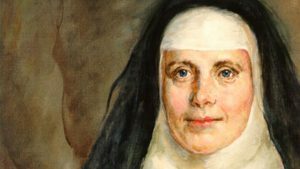 Last September three Sisters of Mercy – Kathleen Rushton, Teresa Anderson and Natalie Murphy – took part in training at the Mercy International Centre at Baggot Street, Dublin, where the Sisters of Mercy were founded by Catherine McAuley in 1831. They returned home to co-ordinate the Mercy International Reflection Process (MIRP) in Aotearoa New Zealand for the Year of Mercy. MIRP seeks to reflect on Pope Francis concerns shared in Laudato Si’ at a local, regional and global level. It hopes to capture the rich diversity, connections and resources within the cultures and spirituality of the 12 Mercy Congregations worldwide and to ‘foster a spirit of contemplation and action’. Faith and science will help focus an integration of cosmologies, social justice and ecological justice. Connection with Scripture and the sacred stories that inform the lives of Sisters of Mercy will support a renewed interpretation and living of the spiritual and corporal works of mercy today. MIRP is not intended to be ‘a conversation that stays with theologians’. Rather, it invites the grassroots engagement of Sisters, indigenous Sisters in their diverse realities across the world, Companions-in-Mercy and friends to enter into this contemplative space for this year. ‘A great cultural, spiritual and educational challenge stands before us, and it will demand that we set out on the long path of renewal’ (LS202). MIRP has four stages. Stage 1 starts with sharing stories and experiences that specify issues about the cry of the Earth and the cry of the Poor as they touch the hearts of participants. Working together, a participating group will choose a key concern to carry forward. In stage 2 the causes of each group’s chosen issue will be explored within social, scientific, political, cultural and economic spheres. Through stage 3, participants will engage with biblical, theological, spiritual, ecclesial and mercy traditions to deepen their understanding of the issue and enable a new vision to emerge. From this, in stage 4 participants will plan a new action to bring about change. Sisters, Companions-in-Mercy and friends gathered in Wellington in February to train as facilitators of groups. The established groups will continue to gather throughout the Year of Mercy. With Pope Francis, we pray his Prayer for the Earth in Laudato Si’ and in mercy ask, ‘Encourage us, we pray, in our struggle for justice, love and peace’. St Catherine’s College students share stories and concerns about the environment. 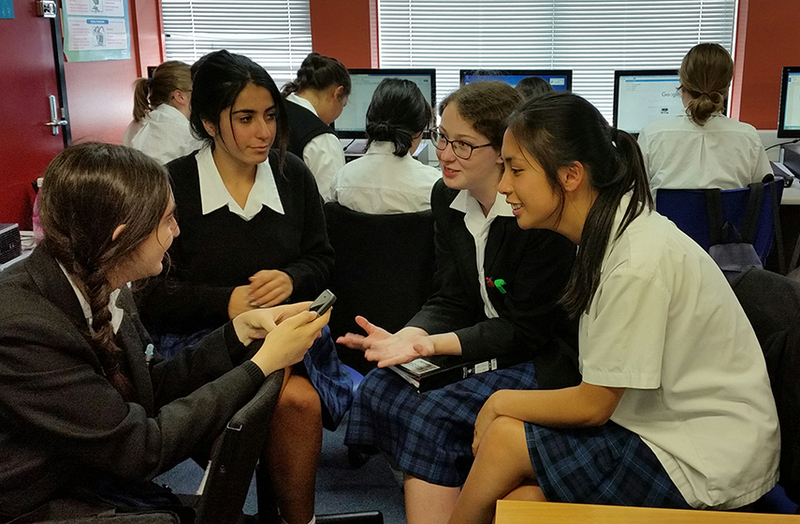 From left: year 12 students, Lara Najim, Aurshenna David, Jessica Hanlon, Erika Sison. The St Catherine’s College community is taking the Pope’s call for the Year of Mercy seriously. We have embraced the Year of Mercy during 2016 and have joined with the Sisters of Mercy in their Mercy International Reflection Process (MIRP). Staff and students recently attended a seminar organised by the Sisters to explore the call to ‘hear the cry of the Earth and the cry of the Poor’. Using the four-stage reflection model from the Mercy International Centre in Dublin, and taught at the seminar, staff have engaged all our students on environmental issues so they can respond in a practical and prayerful way to Pope Francis’ call. Every Monday the students spend 40 minutes in whanau groups to listen to one another’s concerns about the environment. From this, each group will investigate the broader context of the concerns – locally, nationally, or within the Pacific region. The students will search for resources for their plans of action. The third stage involves reflecting on traditional wisdom that can bring new vision to understanding the concern. Students will read a range of scripture as well as theological, ethical and spiritual writings to help them to understand their chosen focus. Progressively they will develop action plans to target their concerns and act to make a difference to the environment. They will have a Special Character day to engage actively with their chosen focus and go out into the community to bring about change. Students are excited that their involvement in MIRP may bring them in contact with other student groups in different parts of the world engaging in the same process. The final stage will involve evaluation and presenting their actions to the whole school and the wider Mercy international community. By December this year, our hope is for the College to envisage new actions to carry forward so students truly embrace and respond to the cry of the earth and the cry of the poor. Kathy Ryan, HOD English, Senior Dean, St Catherine’s College, Kilbirnie. In this Holy Year of Mercy, I especially give thanks and praise to God for the gift of service. Almost ten years ago, I was commissioned lay pastoral leader of St Bernadette’s Parish in Naenae, by then Archbishop John Dew. During nine of those years I had the privilege of working collaboratively with a very wise and humble priest, whose knowledge and perception warned me of many a pitfall and taught me a great deal. I had spent five or six years studying, completing pastoral projects, reflecting and seeking spiritual direction, yet I discovered nothing quite takes the place of lived experience. People have often asked me, how do you find it? How do you do leadership? Do you enjoy it? These were questions I have pondered often as I faced the many challenges of the past years. Life on the frontiers of change is never easy. Most of us tend to resist it. Today, while still facing some of these challenges, I find myself going more into sacred scripture for support, comfort and inspiration. I recall, for example, the words in Genesis – ‘God created man in God’s own image; male and female God created them’. I have witnessed in family life the beauty and harmony that exists where husbands and wives, male and female work closely together, supporting each other as they work to bring up a family. What a beautiful image of Church! And surely one that equally applies to the larger unit of Church – the family of God. When asked about leadership, I feel after all my study, that it is Mary, who is both a model and inspiration for me. Looking at one of my favourite Gospel passages – the wedding at Cana, I find that it was Mary, who with the sensitivity of a woman and a mother, first notices the wine running out. She alerts Jesus to the problem, but Jesus, seemingly not quite ready for public ministry, responds, ‘My hour has not come yet’. Rather than be put off, Mary directs the stewards to do whatever Jesus tells them. We all know how the story ends. The bridal couple are saved from embarrassment and the guests are very happy. Mary’s faith in her Son has saved the day. My journey has led me to many discoveries but perhaps none more profound than the fruitfulness of a ministry that is not only collaborative but also enhanced with the gifts of both male and female. Barbara Rowley is a Lay Pastoral Leader and Pastoral Team Member of the parish of Te Awakairangi, and is based in Naenae, Lower Hutt.